Chocolate.org Chocolate of the Month Club is all about hand-crafted artisan chocolates from world-class vendors and chocolatiers. They seek out the finest chocolates from local and small shops from around the world and always look for refined recipes and unique flavors. With their robust list of membership options, there is bound to be a subscription for just about everyone. A monthly club with numerous options and exceptional quality. The variety of chocolates a person can receive with Chocolate.org Chocolate of the Month Club is impressive. They have unique subscription options that let members pick the types of chocolates they want. Even better, before signing up members can see which chocolates come in what shipment – so there are no surprises. The company takes their selection process very seriously too – and only works with artisan chocolates and world-class chocolatiers. Just some of the choices members can expect include all dark chocolate shipments, truffles, a milk chocolate collection, Kosher options, nuts and chews, mints, premium truffles and more. Chocolate.org Chocolate of the Month Club prides themselves on high-quality artisan chocolates. The chocolates supplied by the club come from world-class chocolatiers, local shops and even small artisans from around the globe. They make sure that their products always meet the highest quality guaranteed and they even seek out those hard-to-find or unique ingredients. In comparison to other chocolate of the month clubs, their quality is excellent, but there are still some clubs out there that offer even more refined or exotic options. There are more membership options with the Chocolate.org Chocolate of the Month Club than any other club can boast about. They even offer unique categories that make it fun to sign up for and participate in the shipments. Prices are competitive with other chocolate clubs as well ranging from $28 to $80 per shipment – depending on the quality and variety selected. Members do have to commit to a minimum three month shipment, but after that, they can be flexible with monthly or bi-monthly deliveries. Also, members can select anywhere from 9 to 12 month commitments – depending on how much chocolate they want to receive. They also have some of the most unique types of memberships, including an all-Kosher selection, Luxury chocolate option, memberships Just for the Guys and memberships with chocolates designed just for women. Unfortunately there are not many perks with the Chocolate.org Chocolate of the Month Club. They do not offer discounts on re-orders and there is nothing special about the membership portal. They do have a blog from their vendors, but it does not offer any tasting or tips like other chocolate of the month clubs offer. The company does offer a quality guarantee, which expands into their shipments. If for some reason the chocolates are damaged or arrive in poor quality, they will refund the order as long as the chocolates are returned (for orders over $120). They rely on timely deliveries using UPS and USPS. Packages arrive within two days of the estimated arrival date and all chocolates are packaged with weather and the type of chocolate in mind. 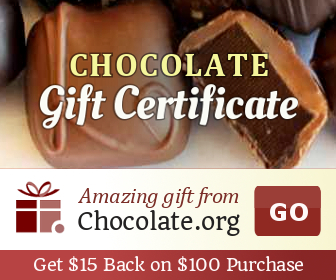 All of the membership options offered by Chocolate.org Chocolate of the Month Club can be given as gifts and they make for excellent gifts. Because each membership offers a unique variety of chocolates, members can better pick a membership for their recipient. There are no special offerings for gift memberships, but all shipments come in decorative packages. There is nothing too special about the website. They have a blog, but it doesn't offer recipes, pairings or extra details. The membership portal doesn't have any special features that cannot be accessed on the site regularly – instead, it is more for membership management. It is, however, very easy to use and information is readily available – which is perfect for new members with lots of questions. Customer service is lacking with Chocolate.org Chocolate of the Month Club – in fact, it is one of their only drawbacks. Members can contact customer service via the online contact form, track a shipment online, etc. via the Customer Service section. They have a phone number as well, but hours are not listed and they do not offer a chocolate concierge service. Dark Chocolate of the Month: Includes everything a dark chocolate lover would ever dream of and includes gourmet chocolates. Starts at $32 per shipment plus shipping. Chocolate Truffles: Includes an assortment of truffles from artisan shops around the world each month. Starts at $28 per shipment with plus shipping. Lady's Choice: The ideal membership for a woman. This club features the types of chocolates that women crave and is perfect for gift giving too. Starts at $30 per shipment plus shipping. Milk Chocolate Collection: Includes the class, rich flavor of milk chocolate in bars, truffles and creative concoctions. Starts at $36 per shipment plus shipping. For the Guys: This membership is all for the men and includes robust, rich chocolates that have strong ingredient undertones. Starts at $30 per shipment plus shipping. Superior Chocolate Collection: First Edition: Includes a high-end, exceptional collection of premier chocolates from around the world. Starts at $45 per shipment plus shipping. All Kosher Collection: These chocolates are all certified Kosher and feature some of the highest rated chocolates in their network. Starts at $35 per shipment plus shipping. Luxury Chocolate Gift Assortments: The idea membership to give to yourself or someone else. 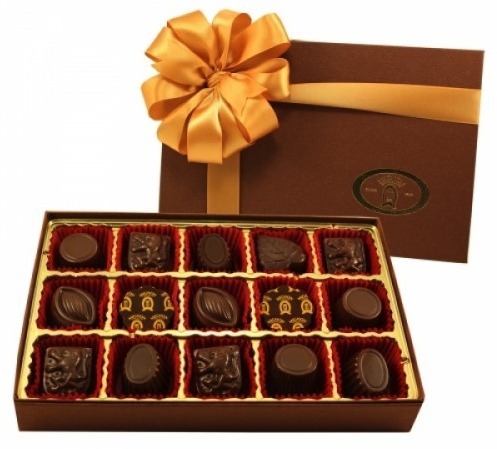 Includes the finest chocolates and gifts from around the world. Starts at $80 per shipment plus shipping. Chocolate.org Chocolate of the Month Club is one of those monthly clubs that is ideal for everyone – especially because they have an option for just about everyone. They can be used as a gift or just purchased for your own. They have flexible shipping options and while they do require a three-month contract, it isn't as long as other clubs that can require much longer terms. There is plenty we like about Chocolate.org's Chocolate of the Month Club. For starters, we love that they include shipping. This ensures people know what they are paying right upfront and no added pricing later on. We also enjoy the variety of club membership options – from Kosher to just for the ladies. It is impressive that they try to offer a chocolate club for just about every type of chocolate lover. While they may not offer any out-of-the-box exotic ingredients, all of their chocolates come from world-class chocolatiers and are exceptional quality. The only thing we do not like is their limited customer support. While there is plenty a member can do online, the Contact Us page doesn't even list the company's customer support phone number. The number is listed on their About Us page – making it seem like they prefer customers to only send inquiries online, which may not work for all clientele. Overall, the club offers some great products and their prices are extremely competitive with other chocolate of the month club vendors. With their numerous membership options, a person could easily try several clubs in a year and get the opportunity to taste their way around the globe. Chocolate.org Chocolate of the Month Club offers numerous monthly club options - from dark chocolate to truffles. Chocolate Truffles: Includes an assortment of truffles from artisan shops around the world each month. Starts at $28 per shipment plus shipping.